Classification folders offer two-prong fasteners on front and back panels and dividers to six separate filing surfaces within each folder. Gusset allows 2" expansion. Folders are made with 23 point, colored Pressboard stock that contains 30 percent post-consumer material. 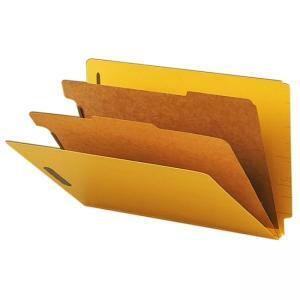 Folders have straight-cut tabs and hold legal-size documents. Dividers have 1/3-cut tabs and are made with 17 point kraft stock.